Camelina [Camelina sativa (L.) Crtz.] of the Brassicaceae family is an annual oilseed crop that has received increasing attention as a biofuel feedstock because of its excellent adaptability to low fertility drylands. Even though moisture is one of the critical factors affecting plant growth and seed yield, genetic studies on response to water deficit in camelina have been limited. This study aimed at identifying camelina genes responding to water deficit and validating their expression pattern. Camelina plants were subjected to 1.9 kPa (well-watered), 4.6 kPa (3 days after water stop), 73.2 kPa (17 days after water stop), and 2.0 kPa (rehydrated) soil water regimes. The transcriptome of test and control plants was analyzed using RNA sequences for de novo sequence assembly followed by gene annotation, which was performed against 39 plant species of the Phytozome database (http://www.phytozome.net). 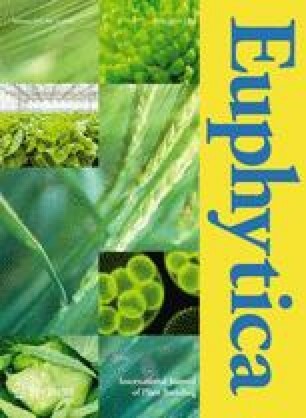 Six metabolic novel genes that responded to water deficit in camelina were selected for further analysis: PYRIMIDINE 4, CYP89A9, FASCICLIN-like arabinogalactan, eukaryotic aspartyl protease family protein, photosystem II light harvesting complex gene 2.3, and adenosylmethionine decarboxylase family protein. The expression pattern of these genes obtained by real-time reverse transcription PCR and quantitative reverse transcription PCR analysis were similar to that obtained by transcriptome analysis. The up-regulated genes are known to function in protecting cells against water deficit, whereas the genes with reduced expression were found to be suppressed by lower soil water causing a decrease in their function. The information obtained from the molecular validation of the changes in expression patterns of these six metabolic genes presents insight as to which genes of the camelina may account for actively responding to soil water deficit, which will be target loci for investigating the allelic variations or SNP screening in the camelina germplasm for future breeding program. The online version of this article ( https://doi.org/10.1007/s10681-019-2402-9) contains supplementary material, which is available to authorized users. We are especially indebted to Drs. Byung Kwan Cho and Eunsoo Park (Department of Biosystems Machinery Engineering, Chungnam National University) for helping with implementations of soil water tension measurement and image acquiring. This research was supported by “Bio-industry Technology Development Program (No. 312033-5)”, IPET, Ministry of Agriculture, Food and Rural Affairs (MAFRA), and by “Plant Molecular Breeding Center of Next Generation BioGreen 21 Program (No. PJ01319303)”, Rural Development Administration, Korea.